Here is my piece for Beate's be inspired challenge yesterday. 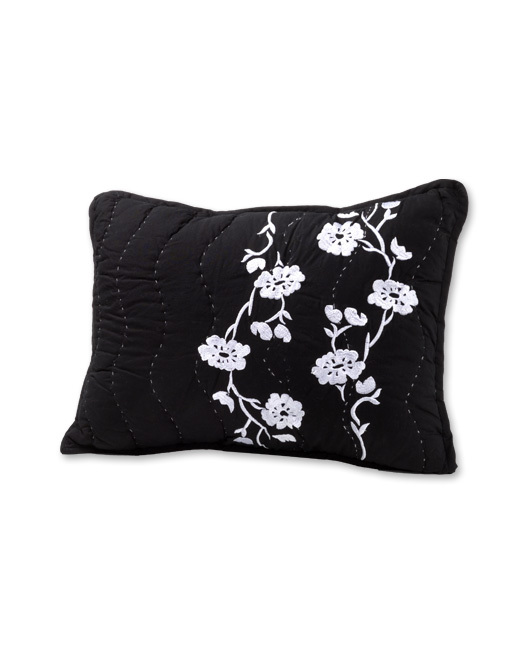 I loved this black and white pillow and immediately thought about how elegant it was. Sometimes I think we tend to forget that black and white is such a stunning, classic combination. Will definitely have to make more of these.Yesterday was a good day and today is turning out well too. We went to the park yesterday and this morning. We painted, played with play dough yesterday. This morning I had the boys tear tissue paper and glue on to pictures (an exercise which helps with fine motor skills). To top it all off, I still managed to get two cards finished and one early this morning. I did the surprise pop up card from Monday's technique challenge and this morning I did yesterday's color challenge using Real Red, So Saffron and Regal Rose. I've provided the links for the cards because I've uploaded them to my SCS gallery instead of here today. I hope you will take a look at them. I felt really good about these cards, because the rest of the day had gone so well and I felt as though I had accomplished more in my mommy world than my stamping world. Today is sketch challenge today for SCS. I am going to work on that this afternoon and will post my sample, hopefully a little later this afternoon. I think possibly Kwerner will post her color inspiration challenge as well, so keep an eye out for that today. It's been a while since we've chatted about GH, so make sure and come back tomorrow so we can dish about PC. Stunning card, so elegant. well done. Really love the B&W card! very pretty.